On Friday, I attended the Steampunk World’s Fair for the first time and gave my first reading outside of the university. The SPWF was a blast. It was like stepping into an alternate reality. There were fantastic costumes everywhere, leather, brocade, rainbows, tulle. Women in corsets, men in waistcoats and gauntlets. The gamete ran from highly realistic to fantastical, and I don’t think there was a bad one in the bunch. Along with the fair-goers, there were also bands, panels (I attended a fantastic one about Edgar Allan Poe, which makes me really want to go to the Poe Museum), and shops. 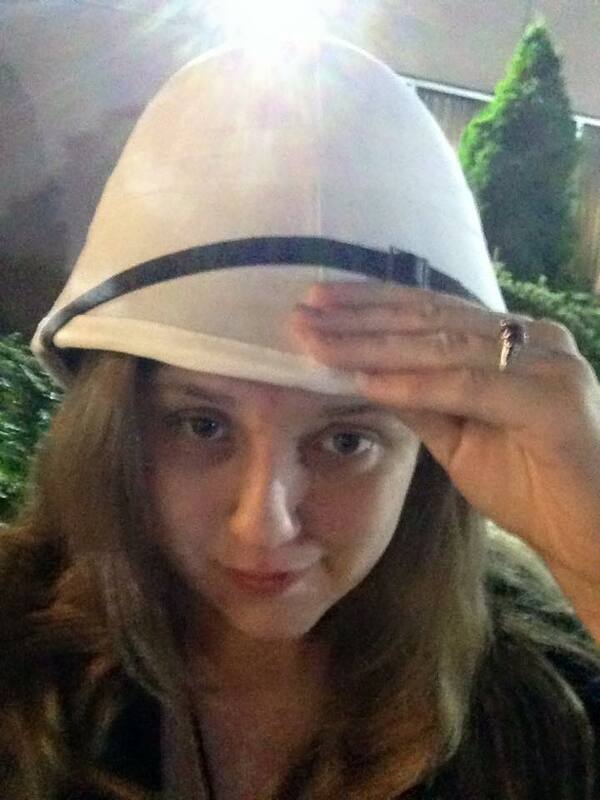 My boyfriend and I stopped at the haberdashery, and I finally got a pith helmet. What I find funny is that I always wanted a white pith helmet, and it turns out that the white ones are from the Anglo-Zulu War, which is mentioned in The Earl of Brass. I ended up not getting too decked out this year. I went as a hybrid between modern and Victorian instead of all steampunk because, as the Awkward Authoress, I was afraid being in a full, rather uncomfortable costume would set my anxiety off. It’s amazing how clothing choice can aggravate anxiety. Instead I wore my corset, black pants, and a biker jacket. Probably a bit more cyberpunk than steampunk, but I was comfortable in my own skin and actually enjoyed myself. My reading itself went a little less smoothly. I ended up being scheduled at midnight as one of the last events of the night, and by then, most of the fair-goers had cleared out apart from the night-owls and revelers. It made me wonder if I screwed up AM/PM on my sign-up papers. Either way, I wasn’t expecting a crowd since I’m a brand new author with a small following. I knew three people were coming for sure, but I was quite pleased to see a few more come. The weirdest part was that my anxiety really wasn’t too bad. I made myself a little outline of what I wanted to cover before I gave my reading, and while I didn’t have a podium, my audience was very attentive and forgiving of the late hour. Then, it got weird. What I can only describe as a New Orleans style band marched past my door followed by a parade of revelers from the courtyard. I could feel myself beginning to sputter. The band was so loud that I had to stop and wait for them to pass and ended up losing my place. Of course my stress level jumped, and I was embarrassed that I had to stop my entire program for a few minutes. Then, I said to myself, “Would it be better to pretend the band wasn’t there and shout over them?” No, it wouldn’t have worked anyway. As my aunt said when I told her, this would only happen to me. If something weird is going to happen, it’s probably to me, and a brass band marching through during my reading was not something I anticipated. Oh well. The best part of the night was that a reader vacationing from Canada came to the fair and attended my reading. 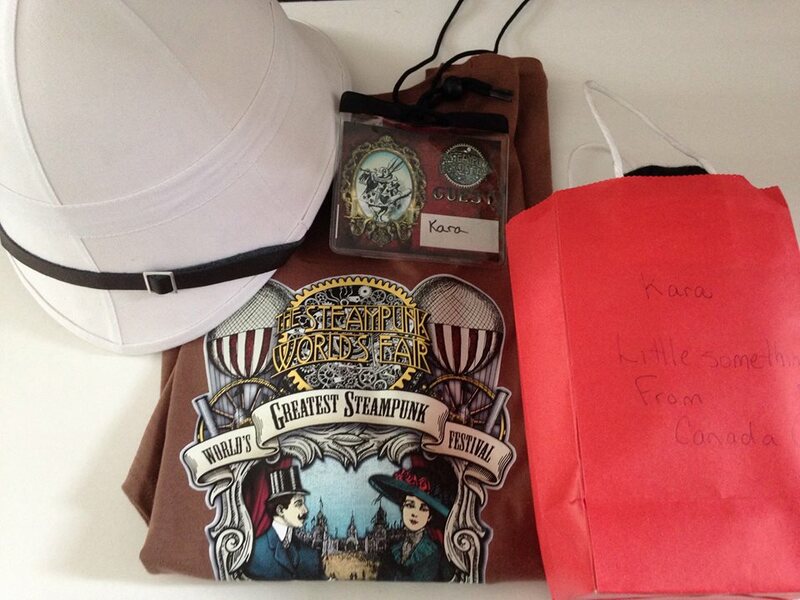 I knew she was coming since we message back and forth on Facebook, and she brought me a bag of goodies from Canada. All of the nights woes and anxieties melted away. It didn’t matter that the band played over me because someone actually: A) cared enough to come B) wanted to hear me read C) brought me a present when she obviously did not have to. I’m eternally grateful to her because she was able to squelch all of my fears and regrets and ended my night on a high note. Thank you so much, Lois! Either way, if you ever want to do a reading or present somewhere, take a chance. Even if the night went a bit awry, it was worth it to get the experience under my belt. My heart feels so happy knowing there’s a Steampunk World’s Fair somewhere out there. I’ve never been super interested in Steampunk but that Victorian literature though. If you’re interested in Victorian lit/the Victorian era, you would probably like the panels. I’m mostly interested in the era rather than the steampunk aesthetic, but the panels were fantastic (Poe, Freakshows, Absinthe, Victorian oddness). I don’t know about other Steampunk events, but this one had quite a bit about the era itself.